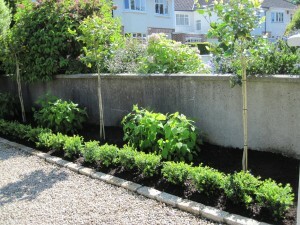 Gardening Blog, Updated newsComments Off on Planting – Re-design your Borders! small pots they occupy but grow to be too large for the average garden once planted in the ground. 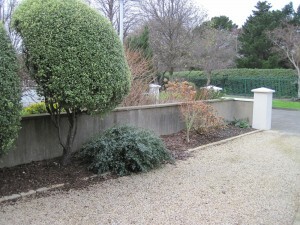 In this garden, the owners have looked after their garden which was not overgrown with weeds or out of control. 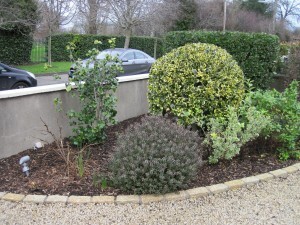 However, even in this case, the garden, which had good hard landscaping and structure showed little interest in the planting with a few shrubs which, in order to keep them under control were shaped into rounded shrubs regularly. 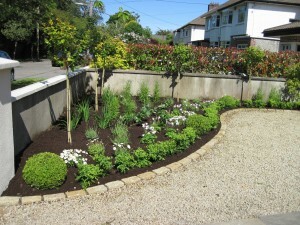 The clients wanted a more interesting planting scheme in their garden with both structure and interest and lots more flowers. Argyranthemum. It is also planned to plant lots of bulbs in the borders this autumn including white Daffodils, white and purple Tulips and purple Allium’s. It will look gorgeous in Spring!